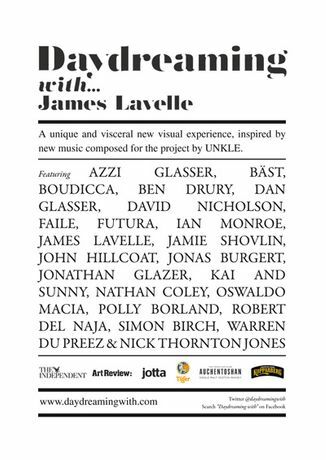 A MAJOR NEW EXHIBITION AND COLLABORATION FEATURING: AZZI GLASSER, Bà âST, BOUDICCA, BEN DRURY, DAN GLASSER, DAVID NICHOLSON, FAILE, FUTURA, IAN MONROE, JAMES LAVELLE, JAMIE SHOVLIN, JOHN HILLCOAT, JONAS BURGERT, JONATHAN GLAZER, KAI AND SUNNY, NATHAN COLEY, OSWALDO MACIA, POLLY BORLAND, ROBERT DEL NAJA, SIMON BIRCH, WARREN DU PREEZ & NICK THORNTON JONES Daydreaming with..James Lavelle is a unique and visceral new exhibition, bringing together some of the most high profile and acclaimed creative names working in music, art, film, fashion and design today. The âpop-up' exhibition represents the first in a series of annual âDaydreaming with..' festivals, inspired by the desire to marry music and art, which examine the intriguing relationship between the two mediums. 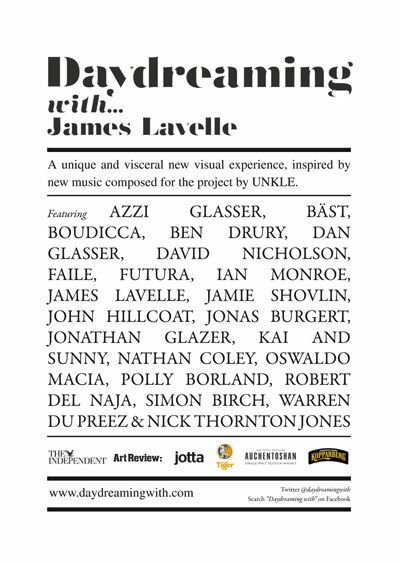 Curated by James Lavelle of UNKLE, each of the artists has responded creatively to exclusive UNKLE music, resulting in an eclectic showcase of talent.